Cover and pages,paper. Cover and paper colour white. Spine bound by brown binding tape. Pages stapled together. Printing in black throughout booklet. 3 sheets of quarto, loose, pencil notes inside front cover, paper white. Date of printing unknown. Adopted in principle Newcastle 1947, Amended Perth 1948, revised Hobart 1949. Issued by the Legacy Co-ordinating Council, Melbourne 1952. "The application of these principles and rules to the domestic policy and constitution of clubs is not obligatory, but in order to ensure uniformity and continuity of policy, should be adopted, except in special circumstances". 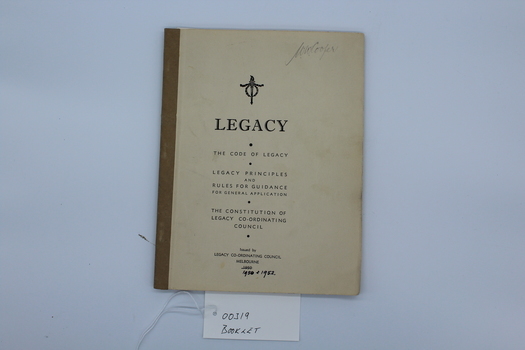 The principles and rules in the booklet are adopted policy of Legacy, determined by resolutions of conference. Issued by Legacy Co-ordinating Council Melbourne 1950. 1950+1952 (hand written in black ink).